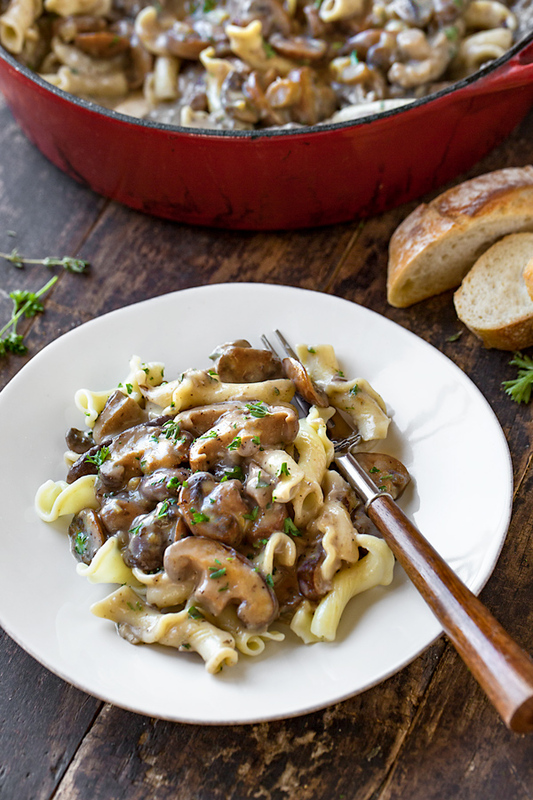 Hearty and deliciously creamy, this mushroom stroganoff finished with fresh thyme makes for a wonderfully cozy (and quick!) vegetarian meal. Warming and comforting recipes with rich, earthy flavors are my favorite kind of recipes for this time of year. I love to gather up a bowl-full of very simple ingredients, a large skillet or pan to prepare everything in, and then serve the finished recipe in a very rustic and “family-style” way, straight from that same skillet with only a few accouterments to accompany it. 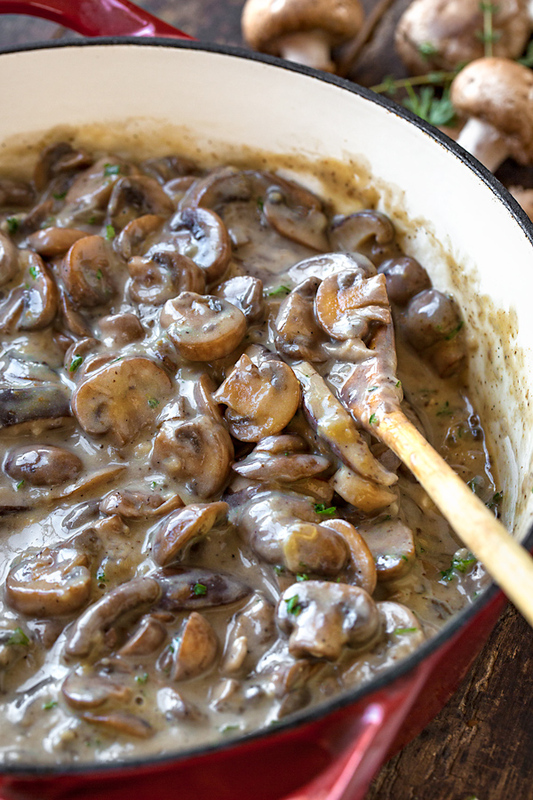 Enter this creamy and velvety mushroom stroganoff, kissed with a touch of rich sour cream, and wonderfully infused with a sprinkle of fresh, fragrant thyme as a finisher. This dish, which happens to be vegetarian, is beautifully filling and “meaty” just as it as, without the addition of any meat. It’s a delicious and cozy recipe to prepare when something flavorful and comforting is what you are craving! For my mushroom stroganoff recipe, I like to keep the ingredients to a minimum, yet choose ones that are filled with lots of flavor. So I opt to use two kinds of mushrooms, cremini and shiitake, as both offer something unique when it comes to texture and flavor. I enjoy cremini mushrooms (which eventually become “portobello” mushrooms once they have matured) because they are hearty and substantial; and when sliced thickly, they offer a wonderfully “meaty” texture to a dish which makes it filling. I also really love shiitakes mushrooms (they are probably my personal favorite mushroom), because while they are thinner and smaller, their flavor is so gloriously bold, and brings an almost garlic-y, slightly “spicy” essence to a mushroom-centric dish. 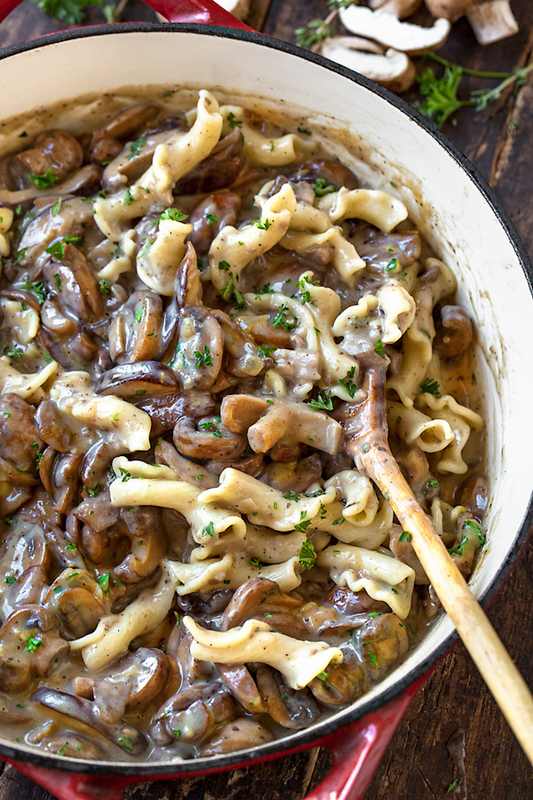 And because mushrooms pair wonderfully with herbs, I really love the addition of fresh thyme leaves and fresh parsley in my mushroom stroganoff, which brings in a bit of a “woodsy” quality and flavorful depth and savoriness. Of course, minced onion and a generous amount of garlic cloves are also necessary ingredients, as they bring the aromatic aspect to the dish, as does a sprinkle of white and black pepper, and a pinch of nutmeg. I even drizzle a hint of white wine into my recipe, as this adds a whisper of something unique and bright, but it can be left out of this recipe, if you prefer. And of course, stroganoff wouldn’t be stroganoff without that rich, creamy and velvety sauce! So I like to use a flavorful mushroom stock as the base when creating the sauce, and finish it off with a touch of sour cream at the end—so delicious! This meal is quick to prepare mainly because of the fact that there’s no meat, which means it’s on your table in about twenty minutes—can’t beat that! First, I prep all of my ingredients, and have them ready to go—slice my mushrooms, mince my onion, press my garlic, pick my thyme leaves, chop my parsley, and measure out my stock, my flour and butter, and my sour cream. Next, I place a large heavy-bottom skillet over medium-high heat, and add in a touch of oil and the butter; I then add in my onions and my sliced mushrooms, and saute those together for about 10 minutes, until they release their juices and begin to caramelize slightly, and become browned. Then, I add in my garlic and allow that to become aromatic, then I add the white wine and allow that to simmer for about 30 seconds. I then sprinkle in my flour, stir to combine, and allow that cook for a moment or two to create my roux (or thickener). Next, I add my mushroom stock to the pan, whisking all the while to avoid lumps from forming in the roux. I allow the mixture to simmer for about 2-3 minutes just until the sauce “tightens up” a bit, and then I turn off the heat, whisk in my sour cream, a pinch of white pepper and nutmeg, and sprinkle in the fresh thyme leaves and parsley. 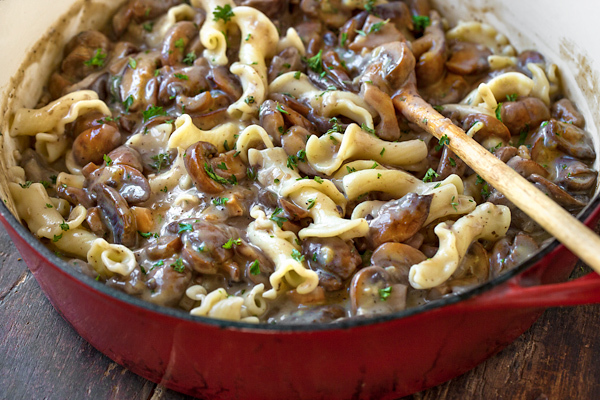 Typically, I like to serve this mushroom stroganoff with pasta or buttered egg noodles, which can be added straight into the pan, or even served on the side. Choose a variety of mushrooms: I love the combination of cremini and shiitake mushrooms, but you can totally use your favorite kinds! 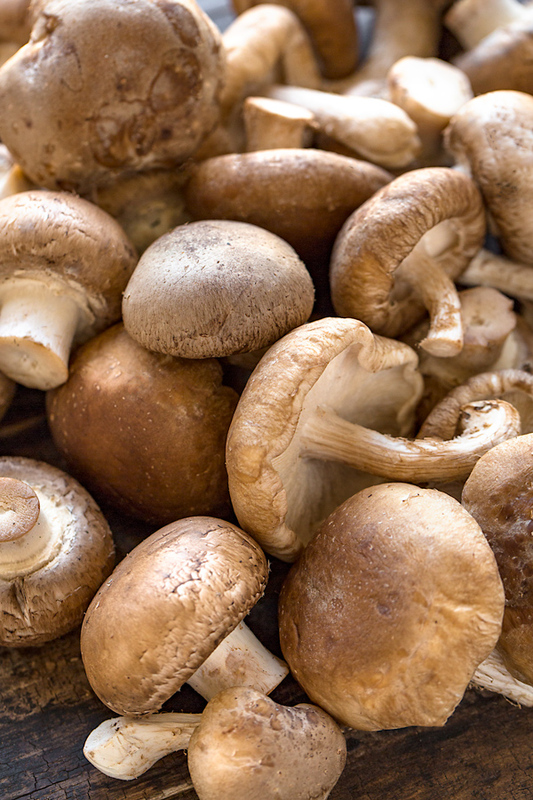 Try to use a combination for flavor and texture purposes, choosing more “meaty” mushrooms such as white button mushrooms, or larger portobello mushrooms chopped into smaller bites, and ones that are aromatic. You can even use dried mushrooms (which have been reconstituted) such as porcini for this recipe. It’ll look like a lot of mushrooms! Two pounds of mushrooms by volume certainly looks like a heck of a lot! But know that just a few minutes into cooking them, they will begin to go down in volume by half (or even more) as their water evaporates. So be aware that the 2 pounds (raw) will yield a perfect amount for the recipe once cooked down. Leave out the wine: While there is only a small amount of white wine in the recipe, you can simply leave it out if you prefer not to use any alcohol. Herbs: Fresh thyme leaves and parsley are great for this recipe, but you can also use dried thyme and dried parsley—just use less. Vegan options: This recipe can easily be adjusted to be made completely vegan by simply substituting the butter for a butter alternative such as “Earth Balance”, or another brand. You could also simply substitute more olive oil in place of the butter. Prep ahead: This is a great recipe to prepare ahead of time—you can make it the day before you plan on serving it, and then simply re-heat it in the pan and serve. Side to serve with: Pasta, buttered egg noodles, spaetzle, pappardelle, or even mashed potatoes are tasty accompaniments to serve with mushroom stroganoff. Even a nice green salad, perhaps with spicy arugula and a tangy vinaigrette, would pair wonderfully with this dish! 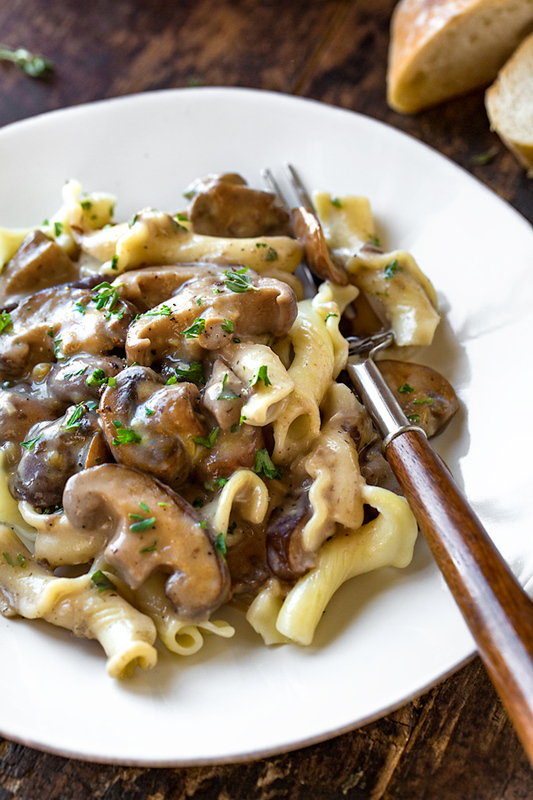 This rich and creamy mushroom stroganoff is a wonderfully cozy and comforting meal, completely vegetarian, and ready in around 20 minutes! -Place a large, heavy-bottom skillet, pan or braiser over medium-high heat, and add in the olive oil and the butter; once melted, add in the finely diced onion and allow that to cook for about 30 seconds to 1 minute just to soften, then add in the sliced mushrooms. -Add a good pinch of salt and pepper to the mushrooms and onions, and saute them together for about 10-12 minutes, allowing the mushrooms to release their liquid and begin to brown a bit. -Next, add in the garlic and stir that in just until aromatic; then, pour in the white wine and allow that to simmer and reduce for about 1 minute. -Sprinkle in (as evenly as possible) the flour, and stir that in to incorporate; then, pour in the mushroom stock, whisking or stirring all the while to avoid lumps from forming. -Reduce the heat to medium or medium-low, and allow the mixture to gently simmer for about 2-3 minutes, just to slightly “tighten up” or thicken. -Turn off the heat and add in the pinch of white pepper and nutmeg, as well as the sour cream, and stir that in to combine. -Add in the parsley and thyme, and have to taste to see if any additional salt and pepper is needed. -To serve, add the pasta or egg noodles directly into the mushroom stroganoff and fold to combine; or, serve with your choice of accompaniment on the side, and spoon the mushroom stroganoff over top. 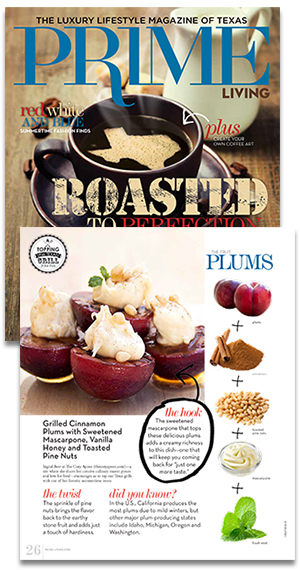 Interested in more cozy and easy recipes? Check out this Chicken Stroganoff, or these Garlic Mushroom Toasts! Lovvvvve mushroom stroganoff!!! This recipe looks great!! Trying super soon. That’s wonderful! I really think you’ll enjoy this one, then! WOW! This looks so hearty and delicious, you wouldn’t miss the meat at all. Thanks for sharing! This looks delicious and I can’t wait to try it. I eat paleo so will sub the sour cream for canned coconut milk, and eat over spiralized zucchini noodles. Roseanne, thanks so much for sharing your experience with the recipe! Made this tonight for the family I work for (and myself!). Everyone, including the 6 year old, loved it! Very hearty, and lots of dynamic flavours. So good! Will definitely be making again! 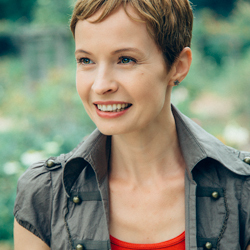 Thanks so much for sharing your experience with me!